Warm Beaches, Tropical Flowers, and the Blue Pacific! maintained grounds and beautiful tropical flowers. complex provided by the Hale Kamaole Co-Op Association. Enjoy an aerial video of the complex and Kamaole Beach Park III. Aerial view of the Hale Kamaole complex and Kamaole III Beach. 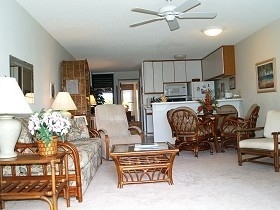 Recently redecorated, one bedroom condo with lanai. Comfortably accommodates two to four persons (800 sq. ft.). (queen-size bed in bedroom, sofa-bed in living room). Fully equipped kitchen, microwave and washer/dryer. Cable Internet/TV, WiFi, DVD/VCR, and AM/FM stereo with CD/cassette player. A short walk to Kamaole Beach and Park, lifeguard protected. Ten minute drive to Wailea and other public golf courses. Two swimming pools, a tennis court, and two BBQ areas. A variety of restaurants are a short walk when you’d rather eat out. which is just a short drive away. No charge for children, aged 12 or under. See our rates and policies for further information. On site concierge desk to help plan your activities. View our occupancy calendar to see the dates that our condominium is available.
" 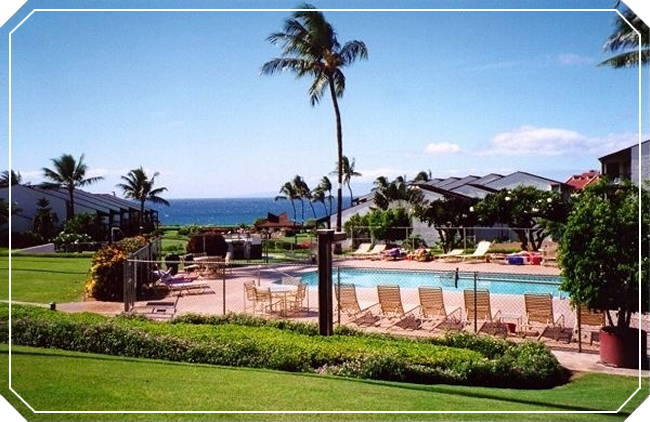 It was truly a pleasure at Hale Kamaole -- From the seamless and expedient check-in to the absolutely great ready to settle-in condo accomodations. A very peaceful community with everything you need Pools, Tennis Courts, Beautiful Grounds, Courteous and helpful Staff, Walk to Shopping and Reastaurants, Beaches Across the Street, Golf Nearby, etc. We were there the 1st week of April and the weather could not have been any better....no decision - we are back soon, Aloha! " "I had one of the best vacations I have ever had staying at the Aloha Dreams condo! The location is second to none being so close to all the great restaurants, shopping and some of the best snorkeling beaches on Maui. The condo complex while close to town, offers a great deal of privacy without the hustle and bustle of too many people at a resort-type setting. The condo is very comfortable and beautifully appointed. They have thought to include anything you might need during your stay." "Thank you very much for sharing your comfortable condo with our family. You made our vacation very pleasant. We appreciate all of your help and guidance. Your condo is accommodating in every way. We used everything it had to offer. We look forward to coming back soon. Hope to meet you one of these days. And you are right, Kamaole Beach is the #1 beach in Maui. We enjoyed it every day." "Thank you for making the condo available to us for our honeymoon. The warm 'home' feel made our stay so very comfortable. It was nice to have all of the conveniences and comforts not to be found at any hotel. We enjoyed our stay here! The grounds are beautiful, the condo is beautiful, and the sunsets - Wow!! Hope to return soon." use the above email link. Thank you.